Ubuntu Kylin is an open-source Linux distribution based on Ubuntu since 2013, mainly developed by a Chinese team alongside dozens of Linux developers all over the world. It contains the basic features you would expect from Ubuntu, plus features a desktop environment and applications. As far as we know, Ubuntu Kylin is one of the most suitable Linux distributions for users who are farmiliar with Microsoft Windows, including its desktop environment, office suite and various applications. The first release, Ubuntu Kylin 13.04, was distributed April 25, 2013, the same day as Ubuntu 13.04. The 9th release of Ubuntu Kylin, our latest version 17.04, was released on April 13, 2017. A highlight feature in Ubuntu Kylin 17.04, which is shown in Figure 1, is a desktop environment similar to Microsoft Windows called UKUI (Ubuntu Kylin User Interface). It provides a simpler and more enjoyable experience for browsing, searching and managing your computer. UKUI is a powerful graphical interface with all the features you'd expect from a modern operating system desktop. At first glance, you might think it's Windows 7. Icons located in the upper-left corner represent the commonly used system functions. When you click the right mouse button on the desktop, a menu pops up. You even can double-click and select an item to execute it. The taskbar is located on the bottom of the desktop just like classic Microsoft Windows. The three icons on the left side of the taskbar are the Start Menu, File Manager and Firefox browser. The icons on the right are network, speakers, battery power, input method and so on. After you execute several programs, their icons emerge in the middle of the taskbar. If you want to see a certain program displayed on the top of the desktop, just click the corresponding icon in the task bar. A Chinese landscape painting is used as the default wallpaper, but you easily can set up your favorite desktop theme and wallpaper through the Control Center. WPS Office is integrated in Ubuntu Kylin as the default office suite (like Microsoft Office in Windows). 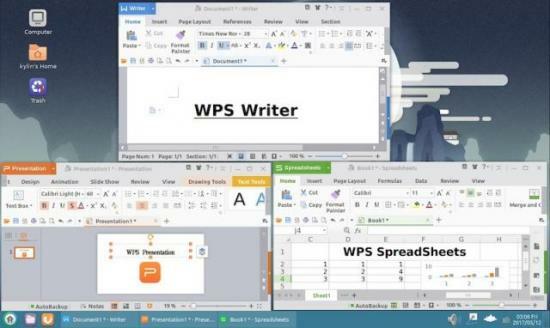 WPS Office is made up of three primary components: WPS Writer, WPS Presentation and WPS Spreadsheet, which correspond with Microsoft's Word, PowerPoint and Excel. Its user interface is compatible with Microsoft Office products, and most important of all, it supports Microsoft document formats besides native WPS formats. For example, a Microsoft Word document (.DOC or. DOCX) in Windows can be edited seamlessly by WPS Writer in Ubuntu Kylin. A Microsoft Powerpoint document (.PPT or .PPTX) or an Excel document (.XLS or .XLSX) also works well in WPS Presentation or WPS Spreadsheet and vice versa. 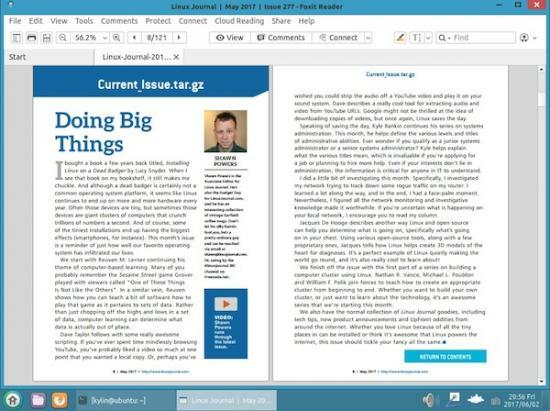 In 17.04, Ubuntu Kylin also is equipped with Wendun Foxit Reader, which is a PDF viewer based on Linux's version of Foxit Reader. For most users, it is easier to install and utilize. In Wendun Foxit Reader, not only is PDF viewing provided, but bookmarks, comments, printing and more are also well supported. Ubuntu Kylin 17.04's Peony file manager, similar to Windows Explorer, displays the hierarchical structure of files, folders, disk partitions and network neighborhood on the computer. Using Peony, you can copy, move, rename and search files and folders. For example, you can open a folder that contains a file you want to copy or move, and then drag the file to another folder. You can open a file automatically by double clicking it. Figure 4 shows how easy it is to find things in the Desktop, Trash and Recent folders. From the personal home directory, you can view and work with files and folders to store documents, graphics, music, videos, downloads or other files you want to access quickly. You also can view "Network", which lists other computers that are connected to your local area network. Ubuntu Kylin provides multiple tools for system management, such as the Control Center and Youker Assistant. Just like the Control Panel in Windows, Ubuntu Kylin's Control Center allows users to view and configure hardware and software. You can set time and date, add and remove user accounts, customize personal options and so on. Hardware, such as network, keyboard, mouse, printer, sound card, monitor and power, also can be configured via the management tool. Youker Assistant is a powerful system management and configuration tool developed for Linux users. It can show system information, clean up system garbage and beautify system customization. It makes your desktop more streamlined, user-friendly and enriched with personality. For Chinese users, Ubuntu Kylin integrates a lot of software with Chinese characteristics. These areas cover system management, daily life, internet leisure and other aspects. Thus, you can use it for work and entertainment. The Sogou Input Method, which is co-developed by the Ubuntu Kylin team and Sogou Corp., is used to input Chinese characters. It's based on the Fcitx framework and supports the same user experience as with its Windows version. Besides Youker Assistant, a series of Youker tools also has been supplied for Ubuntu Kylin 17.04 users. Youker Weather broadcasts weather information provided by the China Meteorological Administration. The Youker Chinese Calendar provides an easy method for querying traditional holidays, solar terms of the Chinese calendar and the Gregorian calendar. WeChat and QQ, two famous social-media apps in China, also are available in Ubuntu Kylin. They provide text messaging, hold-to-talk voice messaging, broadcast (one-to-many) messaging, video conferencing, video games, sharing of photographs and videos, and GPS location sharing. In addition, Ubuntu Kylin can be used to achieve Baidu maps, Taobao shopping, bank payments, ticket inquiries and purchases, and more, through the Firefox or Chromium browsers. 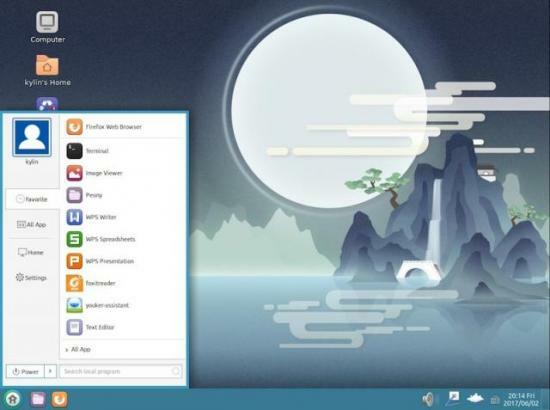 Ubuntu Kylin is an official Ubuntu flavor with a featured desktop environment and applications. It resembles Microsoft Windows with UKUI, WPS suite, Youker Assitant and more, and it's especially suitable for users familiar with Microsoft Windows.